Despite the opinions of some scientists, there are some questions that concern both philosophy and science, and there are certainly some questions that will likely never be solved even by futuristic science. These two issues are at the heart of two recent books I will review: Why Does the World Exist: An Existential Detective Story (2012) by Jim Holt, and What We Cannot Know: Explorations at the Edge of Knowledge (2016) by Marcus du Sautoy. I strongly recommend both books for philosophically or scientifically inclined readers interested in life’s biggest questions and mysteries. Spoiler alert: Holt does not conclusively answer the title question, but by the end of the book this lacuna is almost beside the point. It remains an unanswered and (most likely) an unanswerable question. Holt nevertheless travels around universities and cafes in Europe and America to interview ten of the most brilliant minds across various fields that all have a stake in the question. Over half of Holt’s interlocutors are theoretical or cosmological physicists: Andrei Linde, David Deutsch, Alex Vilenkin, Steven Weinberg, Roger Penrose, and John Leslie; the remaining four are two philosophers, Adolph Grünbaum and Derek Parfit, the theologian Richard Swinburne, and the novelist John Updike. Each interview gives new insight from a completely different perspective and set of assumptions. Holt, a philosopher himself, finally does attempt to formulate his own theoretical flowchart that explains how the universe could have come to existence out of nothing. The result is somewhat technical, metaphysical, and probably not terribly convincing, as the author himself might admit, but still food for a good day’s thought. Why Does the World Exist? is far from a dry recitation of theories and ideas, but rather a lively personal and even emotional journey which invites the reader to think for himself. We travel from place to place with the author, who writes in witty and readable prose. Along the way he fluently provides the commentary on the relevant existential views of virtual every major philosopher in the western tradition, along with abundant references to literature, art, and music. The book is so jam-packed with captivating information that I almost wanted to reread it immediately after finishing–the best praise I can give to a book, especially the philosophical non-fiction variety. What We Cannot Know is another book which doubles as both a big-picture explanation of science and philosophy and a personal quest for the limits of human knowledge. Marcus du Sautoy is a mathematician whose title at Oxford University is Simonyi Professor of the Public Understanding of Science, a chair he took over from Richard Dawkins. 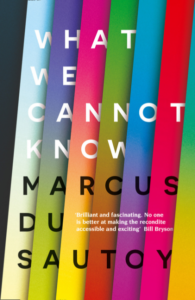 If du Sautoy’s goal is to help the public at large to begin to understand the arcane questions that underpin the latest scientific developments, his book is highly praiseworthy but not completely satisfying. In this book, he sets out the task of exploring the limits of human knowledge in seven specific areas he calls ‘Edges.’ He explains: “They represent the horizon beyond which we cannot see. My journey to the Edges of knowledge to articulate the known unknowns will pass through the known knowns that demonstrate how we have travelled beyond what we previously thought were the limits of knowledge.” Thus, he is interested not just in what we still do not know at the present, but what kinds of questions might be fundamentally unknowable to human science. The seven Edges of knowledge du Sautoy discusses are the following: Chaos Theory, the indivisibility of subatomic particles, quantum mechanics, the limits of the universe, the nature of time, black holes, and what came before the Big Bang, the problem of human consciousness, and the troubling mathematical paradoxes surrounding infinity. Typically du Sautoy devotes two chapters to each Edge, with one being a summary of the relevant scientific history leading up to the present, the the second being an exploration of the possibilities for expanding our current knowledge. One on hand it’s hard to find fault with such an ambitious and erudite book that just about does everything it set out to do. If I have any qualms at all they are more than likely due to my own significant limitations rather than the author’s. I found it hard to keep track of exactly the main point of each chapter, each of the ‘edges’ that were being discussed at a time. Du Sautoy never gives a concise introduction or conclusion of each area that reinforces what the particular question under discussion was. Because of this, as well as the overly long technical sections, it was hard to maintain narrative focus. Added to the fact that I am much less capable of engaging in scientific and mathematical concepts than in history and philosophy, there were chapters which I found myself struggling to get through–say, the minute consistency of leptons, muons, and quarks and how they are measured. Obviously there were parts that I was more interested in than others, especially the more philosophical parts discussing the limits and origins of the universe (naturally, following Holt’s book), and the debate of human consciousness and free will. Du Sautoy presents a massive, almost overwhelming, amount of information, and looking back, I find that there are very few specific things I remember learning from the book, rather than several general viewpoints I absorbed. If I had the time and patience to reread it, I would doubtlessly glean more than the first reading. For those who are analytical minded and interested in the cutting edge developments of science and math, What We Cannot Know is a great book to get you started or broaden your base of knowledge. 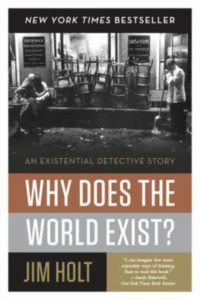 For others who prefer a more speculative, and focused journey into the philosophical history of the investigation of existence, Why Does the World Exist? is probably the best overall summary you will find on the subject. Posted in Philosophy, Science and tagged Big Bang, Existentialism, Jim Holt, Marcus du Sautoy, What We Cannot Know, Why Does the World Exist? Last week, three scientists were awarded the Nobel Prize in Physics for their 1998 discovery that the expansion of the universe is accelerating. This overturned the conventional idea that the universe, at this point in time 13.72 billion years after the Big Bang, was actually slowing down due to its own gravity. Below, you will find a presentation from 2009 by theoretical physicist Lawrence Krauss, called “A Universe from Nothing.” To help put this information in context, I will explain the ‘cosmological argument’ for the existence of God, which it may be useful to read before the video. Then I will attempt to discuss some of the philosophical ramifications of this discovery, as I understand them. It goes without saying that there are many objections to these apparently logical assertions, as well as various versions of the argument (in fact, the differences between these versions has led to it being defined more as a ‘method’ than a specific argument). For starters, a skeptic would not hesitate to make the most obvious objection: “what caused the first cause?”. This also highlights the biggest problem with the entire argument itself–that it depends on some type of causality understood either through deductive (logically necessary) or inductive (gained by experience) reasoning. Basically, our knowledge and ability to understand phenomena is based on our experience as humans on planet Earth, but the same rules of causality may not apply to an unknowingly-vast universe with properties we cannot yet measure or even observe. Secondly, it follows that even if there were a First Cause of the universe that initiated the Big Bang, we have no way of knowing if it was the work of God. The First Cause in this case could also conceivably be some other ‘spark’–this is the central point discussed in the video above. Furthermore, even if it could be demonstrated that God had created the universe (which I think we must understand as ‘causing the Big Bang to occur’), it is still a quite different question to connect this creator God with the God of religions throughout the world. We would be left with the ‘Deist’ God, popular with Enlightenment thinkers, who merely created the universe but then ceased to interact or manifest itself with this creation in any way. Dark matter and dark energy have never been observed. According to my understanding of things, even such possible (and probable) future discoveries will not change the fundamental philosophical or religious arguments and search for proof of the existence (or non-existence) of God. Theists could just as easily explain dark energy as ‘God’s hand’ in the universe, while atheists would take it as ever more proof building up their case that no deity is necessary in order for the universe to work, or even for setting events into motion. In addition, theists who attempt to insert the presence of God into any realms of science that are as yet unknown are making a grave strategic error. This “God of the Gaps” concept risks painting the idea of a deity into an ever smaller corner, as new scientific discoveries will inevitably continue to explain away the mystery. For example, it is only the most remote tribes without knowledge of modern germ theory who still attribute superstitious causes to illness and disease. It is still common for politicians and religious leaders to interpret for their constituencies the divine meaning of various meteorological events (Texas governor Rick Perry thinks Texas is suffering from enormous wildfires and drought because of the Federal Reserve…then why did they strike Texas rather than New York?). My desire is that we respect science and actively discredit anyone who rejects it if it does not fit their own personal beliefs (or financial gain, in the case of industrial polluters spreading rampant climate change denialism). Ultimately though, we still must understand and interpret things beyond the facts that science gives us, and here we must use philosophy and our ability to reason. This is our most advanced ability and the only thing that separates humans from non-human animals, as well as (as far as we can tell) everything else in the universe. If there is a God, it would surely intend us to use our ‘God-given’ reason to question the nature of things and why we find no evidence for God in the universe. Everyone is entitled to their own opinions, but not to their own facts.